A Halifax-based, cross-Canada study proves Aspirin is as effective as rivaroxaban in preventing blood clots after hip and knee replacement surgery. The findings, recently published in the New England Journal of Medicine, mean cost savings for patients and an international change in the use of oral anticoagulants to prevent blood clots after these surgeries. Blood clots are a known risk after hip and knee surgery and can lead to fatal pulmonary embolism, says Dr. Michael Dunbar, the Dalhousie-NSHA orthopedic surgeon who recruited a team of orthopedic investigators across Canada for the study. Aspirin (acetylsalicylic acid, or ASA) has been an agent of interest for its anti-clotting action and low risk of bleeding—but large randomized trials to confirm its efficacy and safety for this purpose have been lacking, according to Dr. Dunbar. Enter EPCAT II… or, Extended Venous Thromboembolism Prophylaxis Comparing Rivaroxaban to Aspirin Following Total Hip and Knee Arthroplasty II. This four-year, double-blinded, randomized, controlled trial, funded by over $3 million in a Canadian Institutes of Health Research grant, was carried out at 15 university-affiliated health centres across Canada. For five days after hip or knee replacement surgery, more than 3,400 patients received a daily dose of rivaroxaban, the most common anti-coagulant in use in Canada and many other countries. The patients were then randomly assigned to continue rivaroxaban or switch to ASA, in the form of Bayer Aspirin, for nine days after knee surgery and 30 days after hip surgery. After 90 days, surgeons noticed little difference in the number of blood clots in the legs and lungs—or of bleeding complications at the surgical site, the main side effect of both drugs. The internationally influential New England Journal of Medicine featured an editorial with Dr. Anderson’s article. “The editorial indicated our results likely would define a new standard of care for the prevention of blood clots following these surgeries,” says Dr. Anderson. In fact, people going for joint replacement surgery in Halifax today would be recommended five days on rivaroxaban and then Aspirin to take at home. Dr. Anderson (pictured above), still practicing clinically, says the study was only possible thanks to the efforts and cohesion of a large local team, including five orthopedic surgeons at Dalhousie Medical School and the QEII Health Sciences Centre: Dr. Michael Dunbar, Dr. Ross Leighton, Dr. David Amirault, Dr. Glen Richardson and Dr. Gerry Reardon. Susan Pleasance, associate director of hematology research at NSHA led the team that organized and executed the study, with “a lot of engagement” from NSHA’s Research Methods Unit, says Dr. Anderson. Born and raised in Halifax, Dr. Anderson graduated from Dalhousie Medical School in 1983, followed by an internal medicine residency at Dalhousie and a research fellowship in thromboembolic disease at McMaster University. “They had a very strong research team in blood clots and I got turned onto that particular field,” he says. 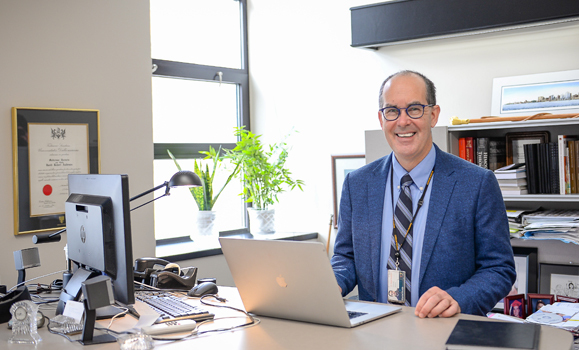 Dr. Anderson brought that expertise back to Halifax in 1992 when he joined the QEII Health Sciences Centre as a staff hematologist and Dalhousie Medical School as assistant professor. Before becoming dean in 2015, he was head and district chief of the shared Dalhousie/Nova Scotia Health Authority Department of Medicine.